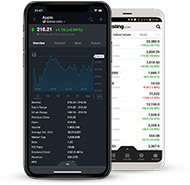 Stay on top of current data on the financial markets in United States, including Major and Sector Indices and their components as well as daily gainers and losers. Using the tabs provided you can find information about the Forex, Options, Futures and Bond Markets as well. Use the buttons, if relevant, to customize for index.